Pectin is a polysaccharide obtained from a variety of fruits. It is used as a thickening and gelling agent in a wide range of foods, including jelly, jam, marmalade and other preserves. The processing vessel is charged with water which has been heated to 140-175ºF (60 - 80ºC). The pectin is sometimes premixed dry with another powdered ingredient, such as sugar typically 1 part pectin to 3 parts sugar. This reduces the formation of agglomerates by separating the grains and also “weights” the pectin to prevent it floating on the water. Alternatively the pectin may be predispersed into liquids such as syrup. The pectin is gradually added into the vortex created by the agitator. Mixing is continued after the pectin has been dispersed to allow hydration to be completed. Product can be held at 140ºF for up to 4 hours, although at higher temperatures degradation can occur after 1 hour and product should be used immediately. The solution is sometimes filtered before addition to the jelly. Agglomerates can easily form. Pectin particles remain undissolved inside the agglomerates. 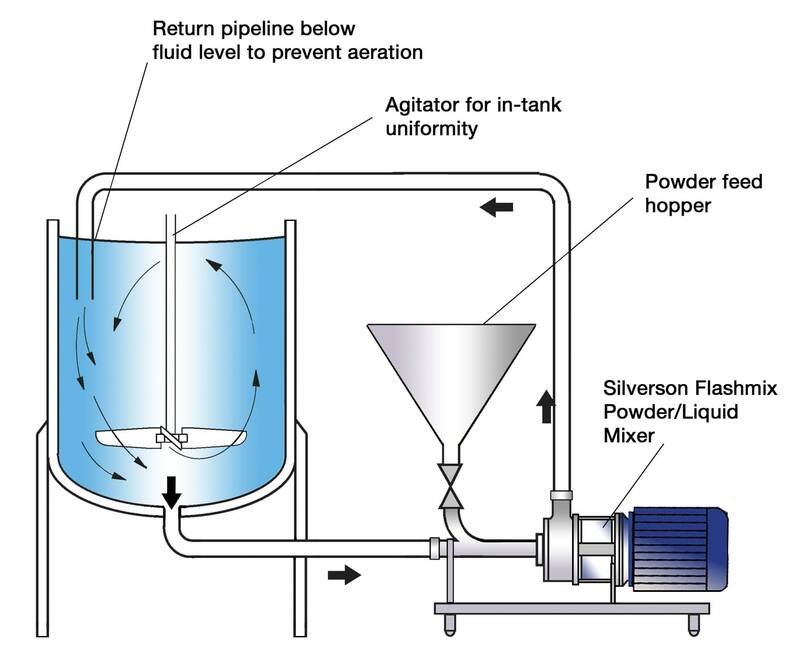 Conventional mixers and agitators do not produce sufficient shear to properly disperse the particles or rapidly break down agglomerates. Powder addition must be carried out with great care to reduce agglomerates. Dry premixing of powdered ingredients increases labor costs and process time. Filtration of poorly dispersed solutions considerably adds to process times. Partially hydrated pectin removed during filtration is wasted, increasing costs and reducing product quality. Undissolved pectin can gradually hydrate during storage or subsequent processing, leading to undesired changes in product viscosity. The pectin is added to the water and dispersed by the in-tank agitator. 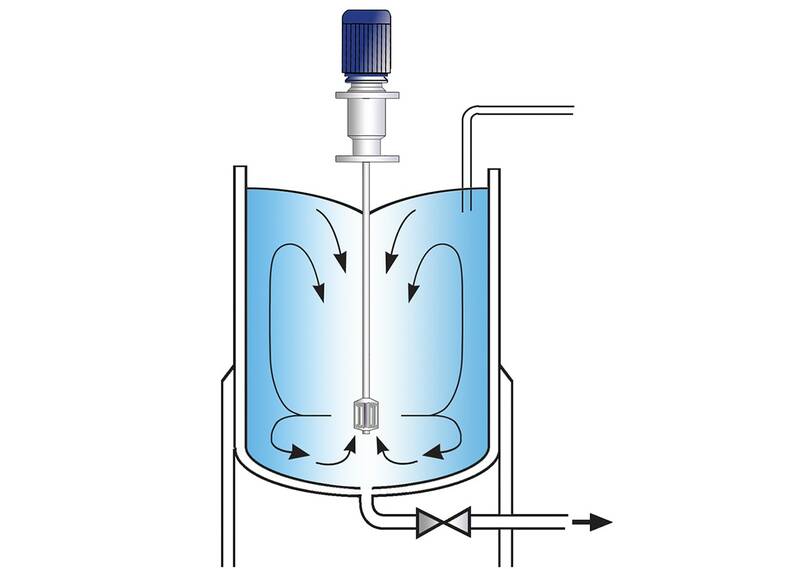 The high speed rotation of the In-Line mixer's rotor blades creates a powerful suction which draws the water and pectin particles from the vessel into the workhead. The materials are subjected to intense shear in the confined area of the workhead. Agglomerates are broken down in the gap between the rotor blades and stator wall, exposing an increasing area of pectin to the surrounding liquid. 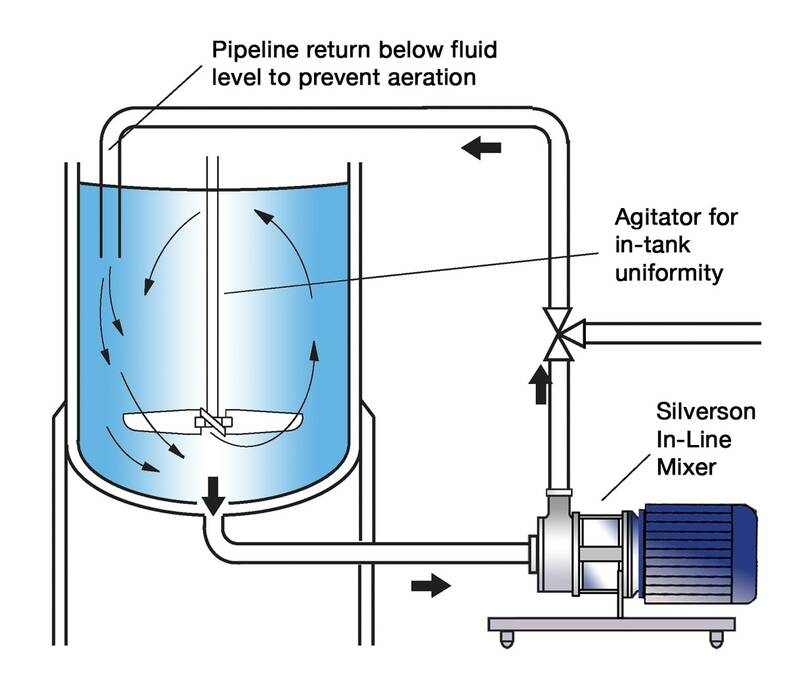 The product is forced out of the stator and returned to the vessel by the self-pumping In-Line mixer. Fresh material is simultaneously drawn into the workhead. In a short mixing cycle all the material passes through the workhead, accelerating the hydration process. Solution can be achieved at ambient temperature, depending on the concentration and viscosity of the end product. Yield of the pectin is maximized, obtaining full thickening/gelling effect. 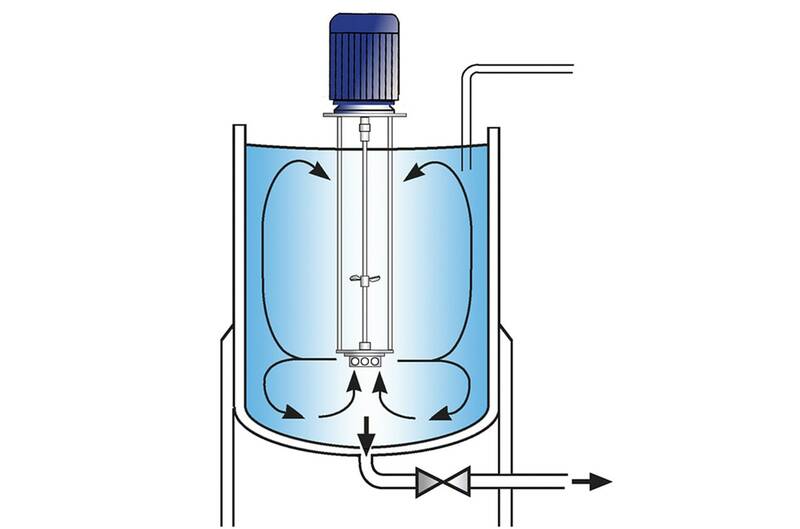 Filtration stage can be eliminated, or where necessary, filtration times are greatly reduced.